Yelp (YELP) shares jumped nearly 10% Wednesday after the company, which provides user-generated reviews of local businesses, announced plans to buy a European rival. The rally came as companies across the social media "ecosystem" basked in the glow of Facebook's second quarterly report as a public company. Facebook's third-quarter earnings topped forecasts, and investors were impressed with the social network's ability to make money off users that access the social network on their mobile phones. 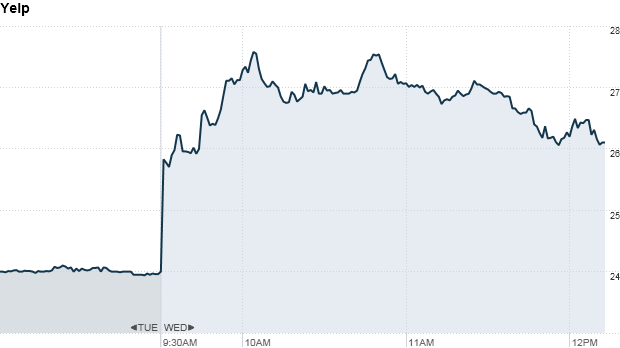 Facebook (FB) stock jumped 22%, lifting shares of LinkedIn (LNKD), Zynga (ZNGA) and others. In addition to the general enthusiasm for social media stocks, investors welcomed news that Yelp has acquired Qype, a local review site with operations in Germany and the United Kingdom for $50 million. In a sign of the times, the latest trend in social networking stocks was a hot topic on StockTwits, the social network for investors. DrDuru: $YELP getting sympathy boost from $FB. Bouncing off 50DMA just as I thought it had broken down again. StockTwits users had mixed feelings about the Qype deal, which the companies said will boost Yelp's unique visitors to 15 million per month across 13 countries. But other users were skeptical that now is the right time to be expanding in one of the more financially troubled parts of the world. WhoWill: $YELP riding up w/$FB here... and does the market it know it just spend $50 mill on Europe look allike? PlayingNicely: $YELP Mmm? Qype 15M visitors @ $50M value vs. $YELP 80M visitors makes $YELPworth $266M or $4.50 a share.